Mary (Gallagher) McSwegan, a widow, was only in the U.S. about three years when this happened. From the information given, her oldest son, Daniel, who was 19 at the time, had signed up her other son, Joseph, for the Navy. The problem was Joseph was only 15 or 16 at the time. Joseph was serving on the ship, the Saranac. I wonder if Daniel was on the same ship. 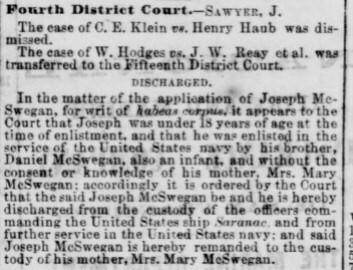 The court ruled that the enlistment was illegal because Joseph was under aged and that he did not have the consent of his Mother. He was discharged from the Navy and given into his Mother’s custody. It is interesting how words change over time. Notice that both Daniel and Joseph are referred to as “infant”. Today, that word has a very specific meaning. If I mentioned an infant, you would think of a baby. Evidently, in the 1860s and infant referred to someone who was not of the age of consent. I wonder how a case like this might start. Would Mary started the proceedings to get her son out of the military? Did Joseph’s commanding officer realize that he was underage without the proper parental consent and set the proceedings in motion to have him discharged? This tidbit adds a little background to the McSwegan story.